Home 1940s 1950s 1960s 1970s 1980s Retro fads Social norms Whatever happened to... Whatever Happened To Enjoying the Backyard? We're half way through the summer now, and I swear I can count on only one hand the number of times this season I've seen a neighbor enjoying their yard. The guy in back of us is building a chicken coop but that doesn't count -- I'm talking about someone throwing a barbecue, kids playing, or simply lounging. Sadly, it just doesn't seem to happen anymore and according to a Boston Globe article that was published a few weeks ago, my fear has been confirmed: the great American backyard is disappearing. Indeed, a good friend of my mother that I've also become friends with was told by a real estate agent that even in our tony town where property is prized (and on the pricey side) that "no one cares about having a yard and the land anymore." In recent years it's become the norm for a developer to purchase and knock down a home that was built in the '50s or '60s, and replace it with a big, ugly, soulless McMansion that takes up way more floor space than the previous house. The less lawn to mow and maintain, the better. For the baby boomers and people of my generation that grew up in the suburbs in the '70s and '80s, it was a different story. Backyards were a haven used for barbecues, parties, games (I still miss the badminton net my parents set up one summer), Nerf toys, Slip 'N Slide, you name it. When I was about five years old my father bought me a swing set from Sears (I remember him partially assembling it in the living room before moving it outdoors.) It was made of metal, so the slide would burn your legs in the summer unless you cooled it by running the hose over it first. The swings hung on chains that could easily pinch little fingers. It also had a monkey bar. All hazardous dangers by today's standards, but I loved that thing! I spent many hours playing on it by myself. And visiting friends' houses as a kid was a treat because it gave us a different landscape to explore. I remember sunning myself at a friend's house as a teen, sipping on lemonade while a radio we brought outside played Tears For Fears on the local pop station. And how many of us had an old man that mowed the lawn shirtless, and rewarded his efforts on a sweaty summer day with an ice cold beer? So why are so few people taking advantage of their yards? Well, I certainly think technology has a lot to do with it. Kids would rather play inside with their mobile phones; it's sad that one of the only ways we can get some young people to go outside and move their bodies is because of a stupid mobile app called Pokemon Go. People would rather catch up on Facebook and check email -- something they can do outdoors with their mobile devices. The Globe article cited the fact that most households are comprised of couples where both people work full-time and just don't have the time to enjoy or maintain a yard, so the simplest solution is to build up their property so they no longer have to worry about it. Here's what I'd like to propose to anyone who's lucky enough to have a yard: take at least an hour each weekend to enjoy it. Make yourself a glass of iced tea, bring a book outside, and inhale the warm summer air for 60 minutes. Spread a blanket on the grass and have a picnic, even if you're the only one attending. Buy some horseshoes, a croquet set, or another game that's meant to play outdoors (how about a ping pong table?) Throw a party or barbecue. We can't make these warm summer days stick around forever, but we can least make a case for preserving lawn space -- before it's too late. A lot of what you say seems true. My neighborhood is somewhat of a rarity these days in that a good deal of us still enjoy our backyards. However, the "younger set" moving in (i.e. 30 somethings) are rarely ever seen outside. I guess it's just us old folks. (i.e. 50 somethings). You know what I've noticed though? It's not the kids who would rather stay indoors, it's the parents who would rather have the kids indoors. On the rare occasions I do see kids playing in their backyards, they seem to be having a great time. Oh, but I will also add this - sometimes I don't blame people for being indoors a lot these days as we often have an entire month of July over 90 degrees with high humidity. That's not enjoyable for anyone. Great post Pam, one I can relate to for sure. My old house was on what is called a 'city lot", about a 1/8 of an acre where my great uncle had lived since 1948, then sold it to me as my first house. It had well established landscaping, was irrigated and I loved it. I spent many a weekend mowing that massive yard, trimming oleander hedges and pruning the grapefruit and orange trees in the back. I lived there for 15 years, got my daughters half raised and was really forced to move because the neighborhood had become too dangerous. There was an actual sign entering the subdivision that had a gun with the red circle/slash mark through that said "No Shooting". I reluctantly went house hunting and was surprised how tiny the back yards were for new houses and how closely they were jammed together. As much as I loved that house and yard, my family was the priority, so I bought a new house with a tiny yard with a little strip of grass in the back. In Phoenix, all new homes must have xeriscape landscaping, meaning no grass in front and low water consumption plants. I admit that I hire a landscaper most of the time now because I don't enjoy cleaning out the rocks of weeds and many of these low maintenance plants can nail you if you're not careful. Your description of your youth parallels my own, though I also remember the huge area behind the church where I spent many a Saturday playing badminton, volleyball and horseshoes in that freshly mown bermuda grass. Good times, good times. Beats sitting in the house any day. They don't know what they're missing. First, I must say I love all the pictures you've chosen for this post. 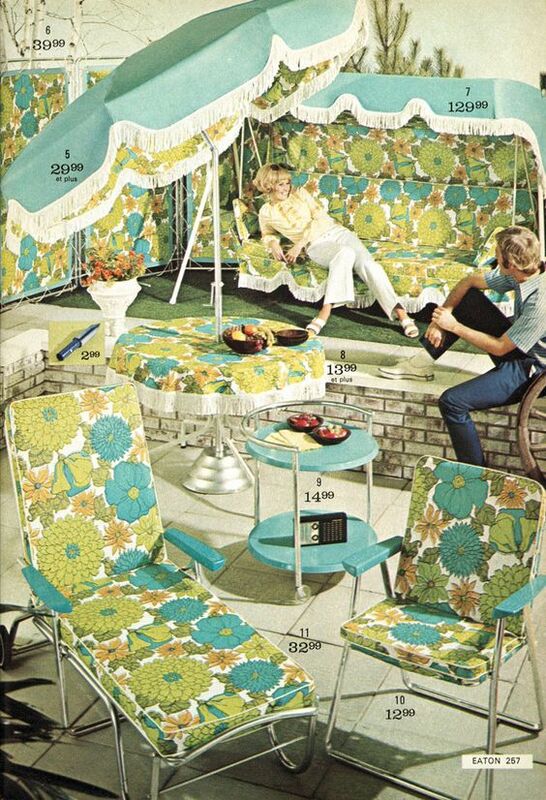 And I want all that patio furniture in what I assume is a Sears catalog page. Every. Single. Piece. Even the floral fence panels. Ooh, the lady at the grill has those long-handled salt and pepper shakers that look like mallets! Love it. 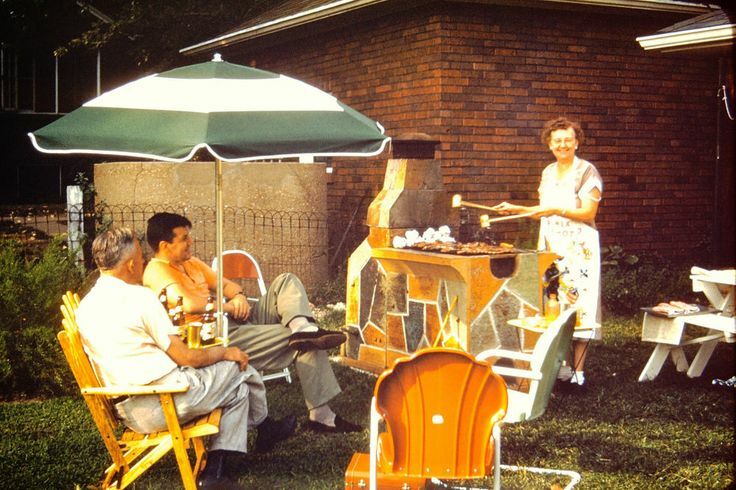 Here's how it is on my end of the street in my Methuen neighborhood of homes built in the mid-50s: I don't spend much time in the actual yard but I like to sit and relax on my deck, and grill there, too. And I putter around in my tiny veggie garden and tend to my flowers. I also like to sit on the back steps and groom my cat. And then I clean off the comb and let the accumulated fur blow away for the birds to use in their nests. My neighbors have 3 kids of college age and every night they and their friends are out in the yard around the fire pit till all hours . They also grill a lot on their deck. And play with the dog in the back yard. The people across the street sit out on their deck each night, too. Oh and the house behind us has a couple of kids and they are outside almost 24/7. 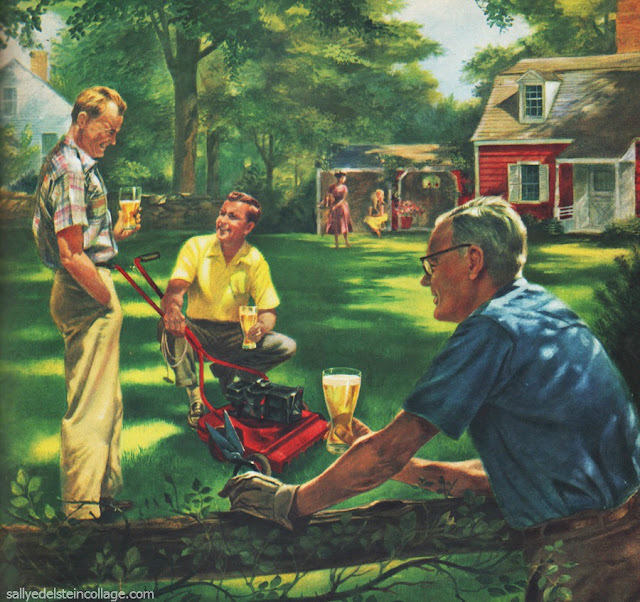 It's about half and half regarding doing their own yard work vs. hiring a landscaper. I hear you about the McMansions sprouting up where once there was a small cape or ranch. They leave like what seems like a 10 ft. perimeter of yard around the house. It looks so out of place among the smaller old homes and the lack of yard space makes it look even more hulking than it it. Thanks for the comment, Doug -- I was wondering what your perspective was since I know you live in an apartment complex. I absolutely think you should invite yourself to that couple's shindig. Well, in the Southern US fire ants happened. Around the mid-80s the imported red fire ant moved into north Texas and made walking in sandals, barefoot, sitting in the grass, or even on a blanket on the grass a dangerous proposition. These days you have to spray heavily before you can let the kids play on that swing set (we have an old Sears set here too) because there are mounds surrounding every leg and the grass is full of them. If you don't the kids come in crying and covered with pustules from the stings that itch for weeks. Even warm winter days will bring them out. I'm trying to find something that will move them out without killing everything or poisoning my kids, but it is an uphill battle. I miss picnics in the grass, nylon webbing lawn chairs, and watching burgers cook on the grill as the kids have water gun fights. "because of a stupid mobile app called Pokemon Go." Yes, because anything that encourages people to get out of the house, get some fresh air, and actually interact with one another, all while having a great time enjoying a harmless distraction during such a turbulent time in American history must be bad simply because you don't personally enjoy or understand it. Amazing how many peoples' chief complaint about video games is that they are sedentary and anti social, yet somebody comes along and introduces something that turns that completely on its head, and there is still griping. I agree with your post, but this commentary was totally unnecessary and makes you sound like an angry, old artifact. Do you watch/read the news? The game has caused one guy to crash his car into a police cruiser, a 14 year-old girl to walk onto a busy street that was practically a highway, and two guys to walk off a cliff in California (I could see if one guy tried to stop the other from falling off, but two???) No, this shows how stupid society has become, and these news stories were all reported in the span of ONE week -- the week the game was released. I predict there will be a death, or two, by the end of the summer due to the game. Plus you places like the Holocaust Museum that actually has to ask the makers to have their location removed from the game's app because it's disrespectful to be walking through Auschwitz's gas chambers looking for a pikachu. And the only generation I've seen more anger from these days are Millennials...which I'm guessing is what you are or you wouldn't have taken offense at someone criticizing your game. The fact that these Millennials can't figure out why chasing around after an imaginary character is stupid is half the problem. The other half is their absolute inability to deal with the real world. They really have no clue how ridiculous they are. We really are dealing with a lost generation here. And I feel for the generation that comes after them and has to deal with the consequences. There's a cool way to combine being out in your backyard with the thrill of the hunt for small creatures. It's called Birdwatching. And if you absolutely have to use your smartphone, there are apps you can get to help you identify what you see. You can even improve your odds of finding unusual specimens by sticking a feeder out there. Interesting that you see the millennials as being angry. I see more anger from baby boomers who tend to blame the millennials for everything wrong in the world today. Not all...but many millennials are super sensitive, over-the-top politically correct, and have a hard time when people share an opinion that differs from theirs (yet they love to preach "tolerance.") I'm connected on Facebook to one of this blog's readers that teaches at a university and you should see the stories he posts. Many of these kids are not going to function when they get out in the real world. In the UK, it was angry millennials that opposed Brexit and then blamed the older generations for "not caring about them." Uh, you mean the generation that fought in WWII so that you would not be under Nazi regime right now? The irony is I heard voter turnout among younger people was rather low for that vote, so if they cared so much about it maybe they should have made a better effort to physically get to the polls. By the way, the baby boomers are the parents of most of these kids...who taught them that everyone gets a gold star just for participating. And I don't care what anyone thinks -- Pokemon Go is stupid and worthy of a blog post. If you can't put the friggin phone away for a half hour and actually look at the real world and enjoy the outdoors without waiting for a video game character to pop up then I feel sorry for you. I grew up on Pac-Man and Donkey Kong, but my parents still made sure I shut the Atari off and got outside. Update...while out on my bike ride the other day, I saw a few guys mowing their lawns themselves, and inflatable water toys on one front lawn which means that family's kids go outside. Also saw tables and chairs on one lawn being set up for a BBQ/get-together.